to support transformation in South Africa. to enable our clients to improve ICT efficiency and business profitability. prosper as contributing citizens of South Africa. Vumela IT Services has a philosophy based on adding value to our customers by recommending and developing solutions to improve productivity, reliability, speed of communications and profitability. Our comprehensive ICT solutions are geared to enable our customers to grow and adapt in a rapidly changing environment. 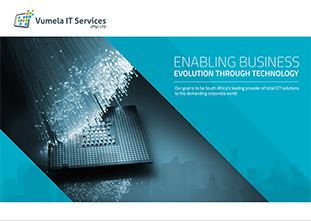 Vumela IT Services provides robust and scaleable business solutions to customers ranging from banks and manufacturing companies to power generation and transport giants. Our services include everything related to the ICT sphere, including initial design and installation of infrastructure to application and desktop support. We believe that every business has the capability to become more responsive, more productive and more profitable through the use of carefully designed and managed IT solutions. We consult with our clients to determine where technology can assist them to achieve these goals in a cost effective and appropriate way. Contact us to take your company to the next level. Reliable and cost effective communications are the backbone of any business. We develop cost effective solutions for our clients that meet their requirements for speed, security and 24/7 uptime. Our experience in many diverse industries has given us the experience to recommend and implement application solutions that allow your workforce to work smarter and provide a better service. Reliable infrastructure and network connectivity is crucial to your business. We ensure that our solutions are robust and adapted to work perfectly in your business environment, wherever your workforce is located. We work with our clients to improve profitability for their businesses. We look at every aspect of the business, seeking to improve efficiency, streamline services and provide solutions that deliver immediate cost benefits and allow scale for future growth. Based in Durban we are proud to offer world-class ITC services to companies in KZN and throughout South Africa.